Pirates set 1788 Treasure Chest isn't part of any subtheme yet. Looking at the content shouldn't it be part of the subtheme Islanders ? No. The subtheme would be Pirates. Most Pirate set don't belong to a subtheme if you look. As a subtheme Islanders ran only in 1994. Not every 1994 set is a Islanders set. Just as not every set with an Imperial Armada or Imperial Guard figure is in the Imperial Armada or Imperial Guard subtheme. 1788 is a pirate base with Islanders as the adversary rather than the Imperail Guard or Soldiers. This is just my opinion. I suddenly want this set. Never seen it before and it looks cool. 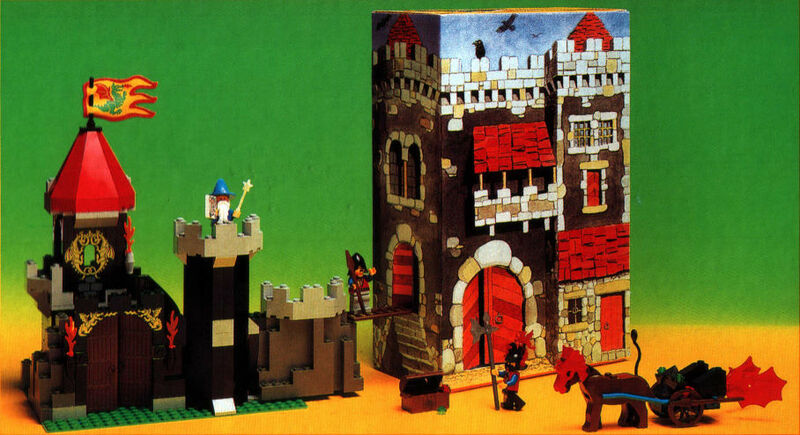 It is a pretty cool set, or at least it was for me when I was a kid and it was brand-new. Its main gimmick is actually not in its set design but rather in its packaging: the reason it's called "Treasure Chest" is that it originally came in a treasure-chest shaped box. Pretty cool, though I can't say for sure whether it's as cool as Majisto's Tower which had a box that could be converted into an additional tower, or The Valley of the Kings which included a carrying canister shaped like a sarcophagus. Overall, sets with packaging this gimmicky gets old after a while and is difficult to store without damaging its functionality. I collected BIONICLE sets for ten years, and believe me, it is a bit of a burden keeping ten years of bulky, reusable canisters (many of which included special play features or attachment points to be used as building elements). As far as action figure sets are concerned, LEGO struck a nice balance in LEGO Hero Factory, with foil bags that can be resealed for storage but flatten out when not in use. But while this maintains the practical function of this kind of reusable package without the costs to storage space, it's true that there was something appealing about the gimmicky packaging of old, which was often almost as much of a toy as the set inside! I'll just use this as an excuse to tout my personal opinion that sets should be able to belong to more than a single subtheme-- I'd go with both "Islanders" and "Pirates" as relevant subthemes, with "Pirates" maybe as a 'primary' subtheme, since the main structure belongs to the Pirates and not the Islanders. (And yes, I'd also argue that you could have multiple 'primary' subthemes, like 1722, which I'd say is equal parts castle and space, and also equal parts "Firefighters" and "Ice Planet"). Generally the attitude I've seen from a lot of people is that the late 90s and early 2000s were a great time for LEGO in terms of trying new ideas, a not-so-great time in terms of actual set design. For instance, a lot of people remember Rock Raiders really well in spite of the sets being heavily reliant on giant, overspecialized parts. Same goes for Ninja, Insectoids, Adventurers, Time Twisters, and Aquazone. The designs were new, and unique, and original, and imposing. But in terms of actual construction quality they were generally pretty lacking. I wasn't even a LEGO builder until 1994/1995, so I can't say whether you're right about that being a definite "turning point". Many of my favorite sets from my childhood are from that very era! But things definitely were taking a turn for the worse as the decade wore on, and while things started to improve throughout the 2000s (for instance, with the LEGO Creator theme gaining some dignity and the "World City" sets gradually bringing us to the design principles that define LEGO City), I'd say it wasn't until the mid-2000s with sets like Café Corner that LEGO design really started to win back the respect of AFOLs.